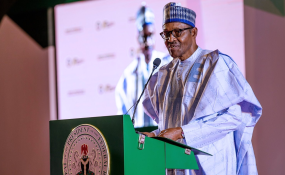 Yenagoa — President Muhammadu Buhari Tuesday vowed to track and recover all funds allegedly misappropriated by previous governments in the power sector without commensurate results. The president insisted that his administration would go after the culprits, apprehend and bring them to justice for frittering away the country's commonwealth. "The third point is fighting corruption under this system. It has been very difficult, but I have been mentioning it everywhere I go that all those who are in place of accountability should be prepared to account for it. "Those that abused it were taken before the courts. A number of them are in jail, and a number of their properties taken away. They will be sold and put in the treasury to continue building infrastructure. "You know we are building roads. It has been mentioned, the railway was virtually killed, but we are rebuilding it. "And there was no power. We will bring power back. The previous government mentioned on their own that they spent $16 billion on power, but you are better witnesses than myself. "Where is the power? Where is the money? We will follow them. Eventually, God willing, we will catch them and get our money back," he vowed. He said: "I stand here as a son of Ijaw land, as a former governor of Bayelsa State, and as Chairman of the Nigerian Maritime University, which is also a school that was instituted by the president. "Ijaw people have no reason not to vote for the president. This time we must vote en masse, there is no Ijaw son that is contesting elections. I can excuse Ijaw people for the last time, but this time, there will be no excuse not to vote for the president."